Yoga Anytime One Month Gift Card- One free month of yoga class streaming with Yoga Anytime! 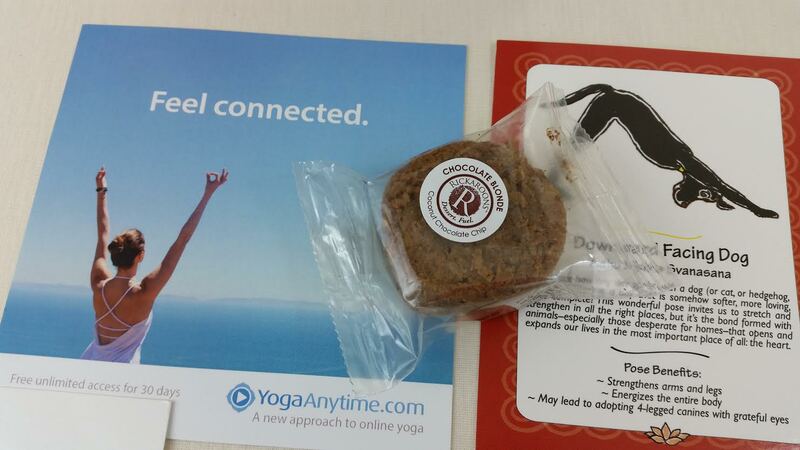 Each Buddhibox also comes with heavy cardstock print of a yoga pose. You can collect quite a few and enjoy the full benefits each position provides. Close your eyes, pick five and go! No Sweat Laundry Detergent- Maybe I'm strange but I *love* getting things like this in my boxes. This detergent has a special enzymatic ingredient that eliminates odors caused by bacteria and oils found in sweat. Since my husband spends half his life in the gym and likes to wear white t-shirts, I can hardly wait to put it's powers to the test! 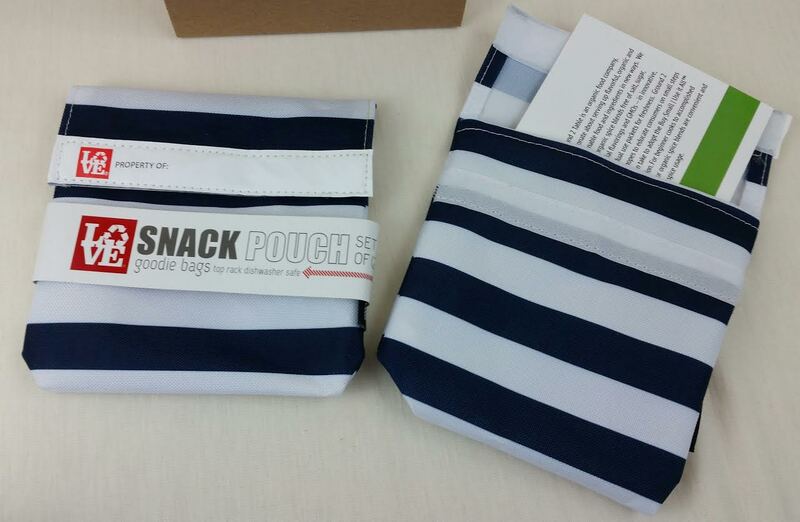 It also erases stains, protects fabric and preserves fit. It's basically magic and if it works like I'm hoping, I'll have to buy more. Co Pur Hair Mask- This is made of 100% natural ingredients and is a moisturizing mask for your hair made from coconut, avocado, bergamot and lavender oils mixed with shea butter. I'm a little concerned that it is no longer the consistency it should be. When it arrived it sloshed like water in the jar. Now that it's cool, it's hardened but only fills half of the jar. It says it's heat sensitive on it. I'm pretty sure that it's totally fine but also that it's lost it's original consistency. I'm hesitant to open it and test it to be sure because I'm allergic to lavender. Boo. Essential Nest Ease Up Headache Relief Rollerball- Omg. when I saw this I was so excited! I do struggle from time to time with migraines (mostly when I forget to take the medication that keeps them from happening) and tension headaches. I was SO sad when I saw that lavender is mixed in with the peppermint that I love and sweet almond oil. My dang allergy to lavender is REALLY cramping my style! I checked out the Essential Nest Etsy site and the "Just Breathe" sounds amazing! 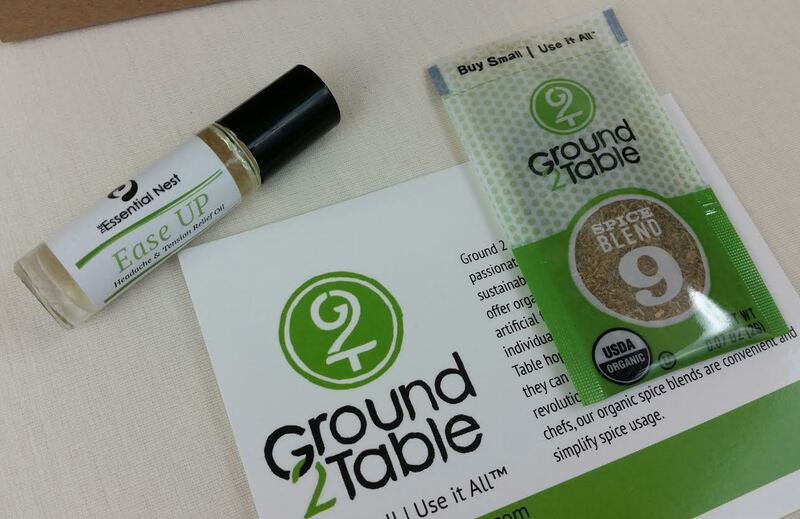 Ground 2 Table Spice Blend Packet- Is it bad that every single time I looked at this my brain automatically thought "Ground Zero?" Literally every single time. Maybe it's because it arrived around the anniversary or maybe it's because I was there in the aftermath and have a really strong attachment, I don't know. Brains are so weird. This is a small seasoning packet and that's the whole point. Instead of buying a huge jar that eventually goes to waste because you don't use it fast enough, and consigns the container to the recycle bin, Ground 2 Table encourages only using exactly what you need to avoid waste. This is an organic blend with no salt, sugar or GMO's. 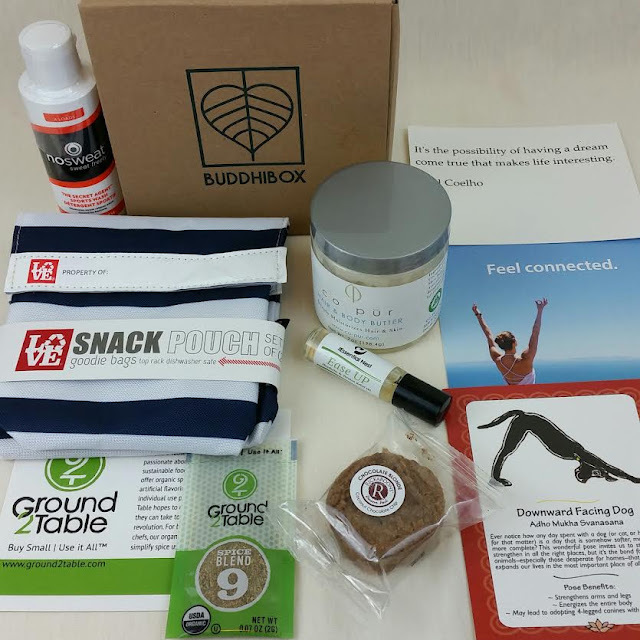 VERDICT: I'm really impressed with this months Buddhibox! If you're a yogi, you'll love all the free access to different yoga classes and sites. Every month has a new one, it's a great way to find the perfect site for you. 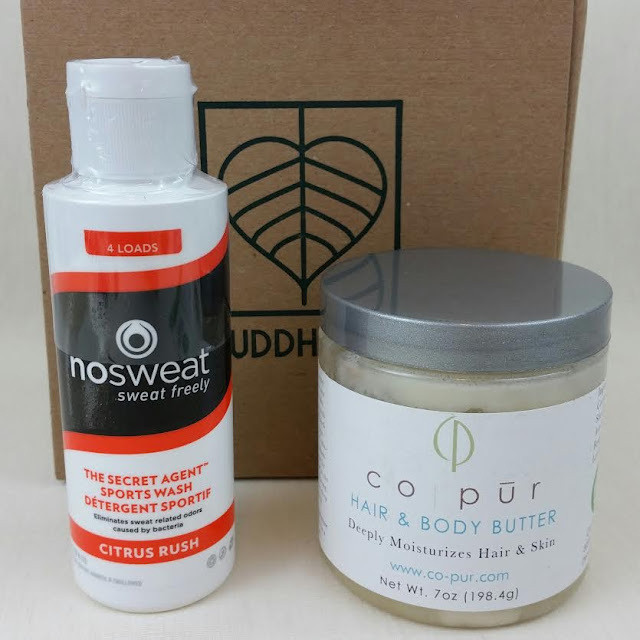 Plus, every box seems to include a type of aromatherapy to enhance your life, your meditation or your mind. This month is especially awesome because it addresses your lifestyle, as well, including things for your laundry and home that help you life a more sustainable, eco-friendly life. So awesome! Buddhibox really provides a way for a more authentic and mindful yoga life. It includes products for every aspect of your lifestyle and encourages you to be thoughtful of yourself and your environment. So sorry you couldn't try Ease Up! I'd be happy to send you Just Breathe if you send your contact info!